May 21, 2018 By Allyson 17 Comments This post may contain affiliate links. Read my disclosure policy. RReady for a Turkey Club Sandwich taken to the next level? 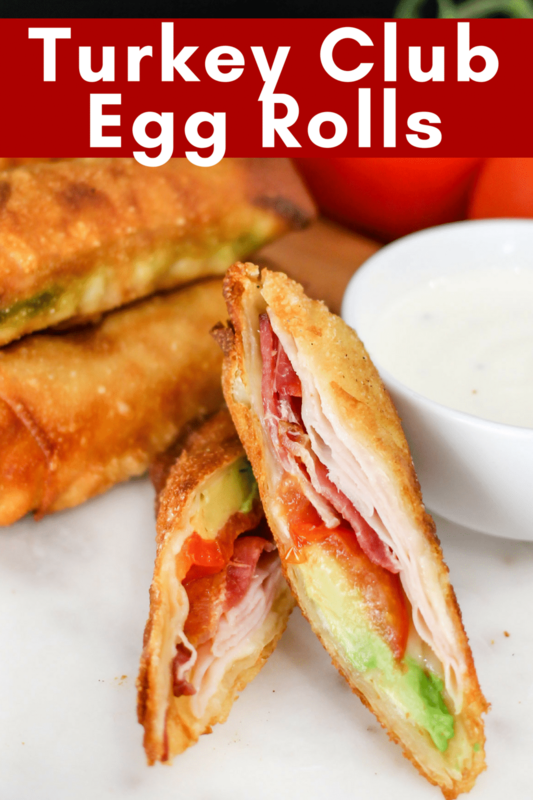 These crispy Turkey Club Egg Rolls are filled with turkey, bacon, tomato, avocado, cheese, and a special sauce! You will LOVE them! This is a sponsored conversation written on behalf of Hillshire Brands Company. The opinions and text are all mine. 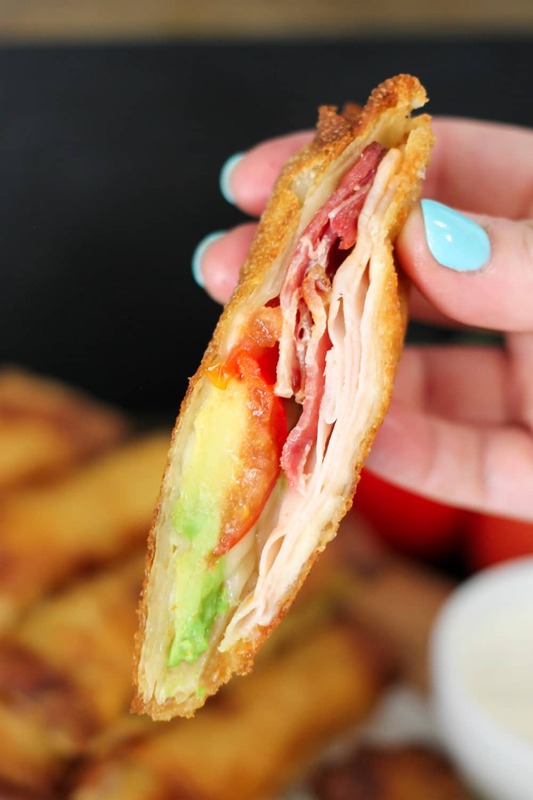 If you like turkey club sandwiches, you are going to LOVE these Turkey Club Avocado Egg Rolls. They are super easy to make and so delicious! Stacked with Hillshire Farm® Oven Roasted Turkey Breast, Swiss cheese, juicy tomatoes, and creamy avocado, then topped with a special sauce. They are a perfect appetizer or meal. I LOVE making egg rolls, so be sure to checkout my popular Spinach Artichoke Egg Rolls, Bang Bang Shrimp Egg Rolls, and Philly Cheese Steak Egg Rolls as well! Make sure you prep all the ingredients before you start making the egg rolls; think assembly line. 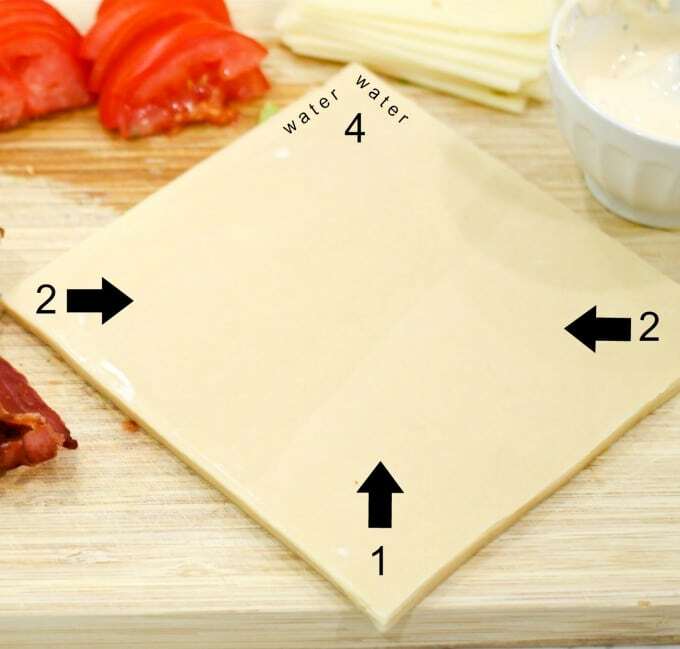 Making one at a time, smear some sauce in the middle of the egg roll wrapper, top with one slice of Hillshire Farm Oven Roasted Turkey Breast, bacon, tomato, avocado, and cheese. Carefully wrap the egg roll, making sure to keep it tight so the ingredients don’t fall out (see more specific wrapping directions below). Rub water on the final corner of the egg roll, and press to seal the wrapper. Heat oil in a large heavy bottom skillet. Once the oil is heated up (about 5 minutes on medium heat), add turkey club egg rolls to the oil, leaving room around them (probably will need to do 2 batches). After the first side has browned (3-4 minutes), carefully turn over and cook 1-2 minutes on the second side. This side will cook faster so keep an eye on it. Once all of the egg rolls are finished cooking, cut them in half and serve with your delicious homemade ranch dipping sauce. Where to find Hillshire Farm Oven Roasted Turkey Breast? I typically shop for Hillshire Farm Lunchmeat at my local Walmart. You can find their products on the lunchmeat wall, near the other pre-packaged meats and cheeses. Walmart now offers Online Grocery Pickup which is amazing and a TOTAL time saver! I use this whenever I have a busy day and know I won’t have time to run into the store. Check your local Walmart to see if OGP is available near you! Use this IBotta coupon to save on Hillshire Farm Lunchmeat Red Lid Varieties (5/20-6/30) at your local Walmart. 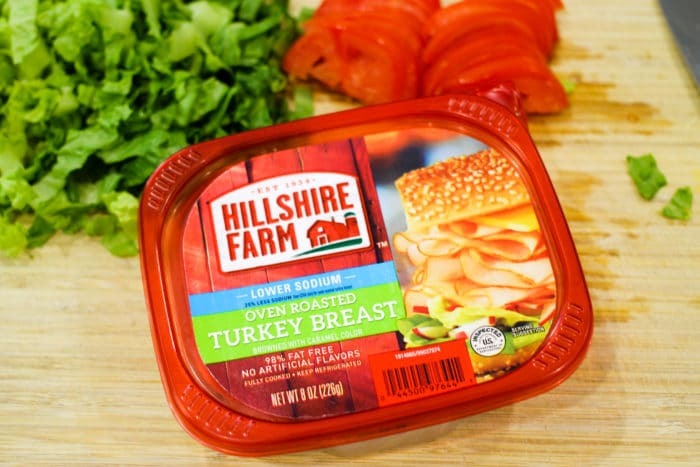 I like opt for the Hillshire Farm brand because it has no artificial flavors, no preservatives, no added nitrates or nitrites; I can feel good knowing what I’m feeding my family. Take the bottom corner and fold it tightly over the contents of the egg roll. Take the 2 corners on the outside and fold them over tightly. Then roll the egg roll keeping it tightly together. Stop before the top corner. Dip your finger in a bit of water and run your wet finger along the top corner. Continue rolling to seal the egg roll. When to serve Turkey Club Egg Rolls? Hosting a party? These make a perfect appetizer! You can even make them ahead of time, store them in the fridge, and then before the party fry them up. Stuck in a dinner or lunch rut? Whip these up (only takes 15-20 minutes) and treat yourself and your family to an amazing meal! Neighborhood Bunco? 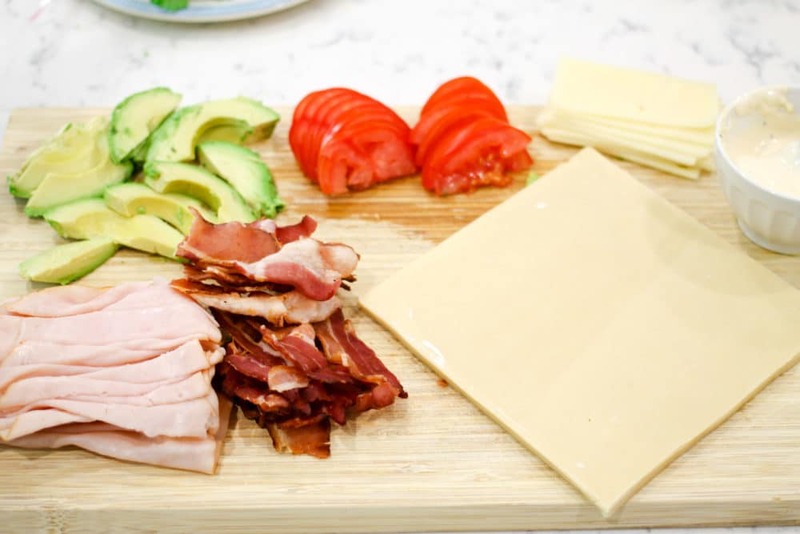 Surprise your neighbors with this twist no a traditional Club Sandwich. Whip up a grilled turkey and cheese sandwich to accompany this delicious Roasted Red Pepper Soup. Ham and cheese grilled cheese is the perfect accompaniment to this delicious Tomato Basil Soup. Add Hillshire Farm ham or turkey to make-ahead Egg Muffins! You can pretty much add whatever you want to this quick morning breakfast! My fav? Ham, cheddar cheese, and tomato! YUM! How about breakfast for dinner? Add ham or turkey to this delicious vegetable frittata to make a balanced meal! Ready for a Turkey Club Sandwich taken to the next level? 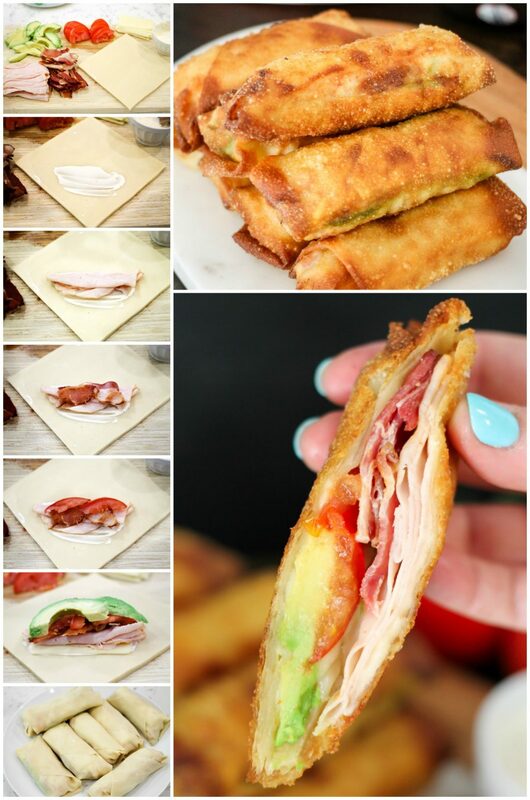 These crispy Turkey Club Egg Rolls are filled with turkey, bacon, tomato, avocado, cheese, and a special sauce! You will LOVE them! Mix mayo, Greek yogurt, milk, and ranch seasoning in a bowl; set aside. *Make sure you prep all the ingredients before you start making the egg rolls. 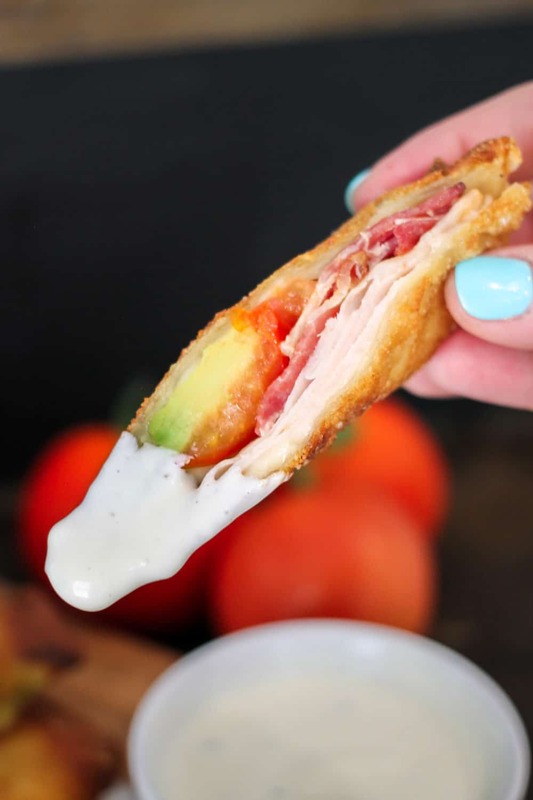 Making one at a time, smear about 1/2 tsp-1 tsp ranch sauce in the middle of the egg roll wrapper, top with 1/4 slice cheese, slice of Hillshire Farm Oven Roasted Turkey Breast, bacon, tomato, avocado, and 1/4 slice cheese. Carefully wrap the egg roll, being careful to keep it tight so the ingredients don't fall out (see more specific wrapping directions above). Dip your finger in water, then run it along the final/top corner of the egg roll, and press to seal the wrapper. Carefully remove from skillet and set on a paper towel lined plate. Continue cooking egg rolls in batches until they are finished. Allow the Turkey Club Egg Rolls to cool for 5 minutes. Cut them in half diagonally and serve with the delicious homemade ranch dipping sauce if desired. I love a good turkey club and a good egg roll. The combination for these two might become a new favorite of mine. I wonder if these could be done in an air fryer? These look so good! My husband will love these! Now that summer vacation is here, I am looking for lunches that my kids will love. This is perfect! They will also love that dipping sauce. My family is going to love this one! I would love to wake up with these! What a fun way to change up a turkey sandwich! My crew will flip for that dipping sauce too! This is such a great way to change things up! How fun! What a fun idea! It looks so tasty!! My son definitely love this sandwich! These look amazing! Just one question, what kind of cheese did you use? You mention cheese in the instructions but I don’t see it in the ingredients list. Thank you in advance! I can’t wait to try these! Thanks for catching that! I used Swiss cheese and I used 1/2 slice per egg roll, cut in half. I don;t think I ever looked at an egg recipe this way. This is a marvelous idea and one that I want to try out immediately. Me and my entire family go mad on everything eggs, so when I introduce them to Turkey+eggs, they are going to dance their way into the dining room, lol. Thanks for doing this.